Manuka honey is produced by bees which gather nectar from the Manuka bush (Leptospermum scoparium) one of the most widespread indigenous New Zealand shrub species. Manuka honey's unique anti-bacterial constituent, the naturally-occuring compound Methylglyoxal, is present only in honey from Manuka flowers. This fast-growing Manuka shrub of up to 3-4 metres is found in wetlands, coastal areas and lowland forests. Manuka prefers wetter soils, persistently dominating wetland margins. Manuka is very tolerant of wind but is not shade tolerant. Manuka is sometimes confused with a similar shrub called Kanuka (Kunzea ericioides), a faster-growing plant of up to 7 metres, which is very hardy, tolerant of drought, frosts and poor soils. There is no Methylglyoxal found in Kanuka honey, nor in honey gathered from similar but genetically different populations of the plant in Australia. The amount of Methyglyoxal (and therefore the anti-bacterial strength) is higher in some Manuka honey than others. Research suggests this may be due to higher stresses on Manuka plants due to circumstances such as coastal location, low soil fertility or drought. Manuka flowers profusely for about four weeks, a little earlier than Kanuka, and also in irregular bursts at other times. 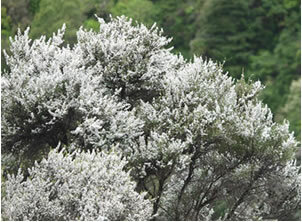 Because New Zealand is a long relatively narrow country, regional variations extend the peak Manuka flowering period from November to January. This enables beekeepers to target the Manuka honey flow, through a combination of hive location and timing.